Το Quan Quan Hotel, στην περιοχή Χάι Τσάου σε Ντα Νανγκ, αποτελεί δημοφιλή επιλογή για τους ταξιδιώτες. Το ξενοδοχείο βρίσκεται 1 Km από το κέντρο της πόλης και σας προσφέρει εύκολη πρόσβαση σε σημαντικά μέρη της. Από τη βολική της τοποθεσία, η ιδιοκτησία προσφέρει εύκολη πρόσβαση σε κορυφαίους προορισμούς της πόλης. Το Quan Quan Hotel προσφέρει άψογη εξυπηρέτηση και όλες τις βασικές ανέσεις στους ενθουσιώδεις ταξιδιώτες. Το ξενοδοχείο σας προσφέρει μια μεγάλη επιλογή υπηρεσιών, συμπεριλαμβανομένων των 24ωρη υπηρεσία δωματίου, δωρεάν WiFi σε όλα τα δωμάτια, 24ωρη φύλαξη, ημερήσιος καθαρισμός, ιατρείο. Η ατμόσφαιρα του Quan Quan Hotel αντανακλάται σε κάθε δωμάτιο. Στην ιδιοκτησία θα βρείτε επίπεδη τηλεόραση, κρεμάστρα ρούχων, λευκά είδη, καθρέφτης, πετσέτες, καθώς και πολλά άλλα. Εξάλλου, το ξενοδοχείο διοργανώνει πολλά ψυχαγωγικά δρώμενα έτσι ώστε να έχετε πολλά πράγματα να κάνετε κατά τη διαμονή σας. Έξοχες υπηρεσίες και μια εξαιρετική τοποθεσία κάνουν το Quan Quan Hotel την ιδανική βάση από όπου θα απολαύσετε την παραμονή σας στη Ντα Νανγκ. Fairly close to the airport. There are a couple restaurants near the hotel, but don't expect much. Our room, however, was surprisingly spacious. There was still some hair in the fridge, so the cleanliness part can use some improvement. But overall, it was a good stay. What pissed me off was--I was made to pay for the water bottles that the hotel card says are complimentary. Good hotel with decent facilities and great location near the airport. No reason not to stay here for a night or two. Also, very cheap and affordable. Receptionists are nice and cordial, housekeeping up to the mark, but not many decent restaurants for tourists nearby. If the objective is to stay near the airport for early flight, this is an acceptable place to stay. Room is not too bad. It's important to mention that this hotel is near the hospital, some may have issues with the usual hospital smell (am one of them). 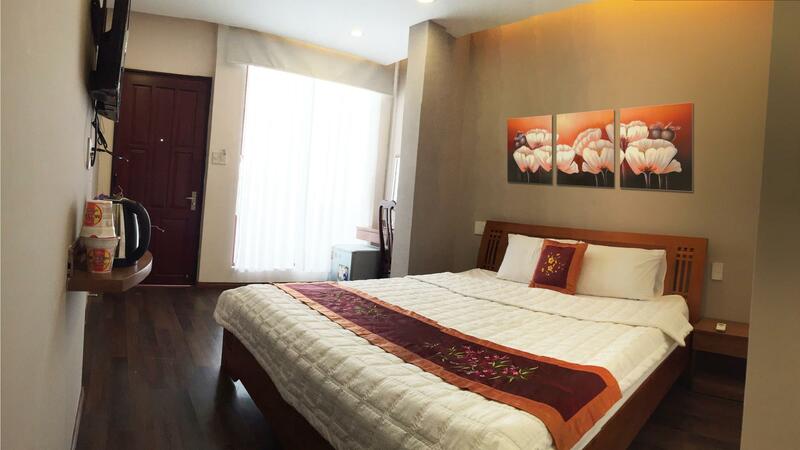 Very reasonable rate for a nice, clean room very close to Da Nang Airport - within walking distance or 5 minute taxi ride if you have luggage; costs about 30,000 VND. Staff are very pleasant, helpful and friendly. Would definitely stay again if I need easy access to the airport. Located on a main street but a few hundred meters walking to local restaurants and less than 100 meters to a good bakery. We spent one night here on the end of our trip to Vietnam. The room rate was an amazing deal and was just what we were looking for: no frills, just a place to sleep before our early morning flight. The staff was extremely kind and helpful. They gave us extra water for our children for free, woke up early to help us check out at 4:30am, and even carried one of our sleeping children to help us catch a taxi to the airport. The room is not amazing, but is a very sufficient place to sleep for a night or two. It was also a short ride to Asia Park, where you can ride the huge Ferris Wheel and a lot of other rides, which our kids LOVED! Despite being located on one of Da Nang's main roads, this hotel is very quiet. It's the perfect place to stay if you have an early morning flight the next day, as it's only a 10 minute walk from the airport terminal building. Also only 10 minute walk to the city's main park. 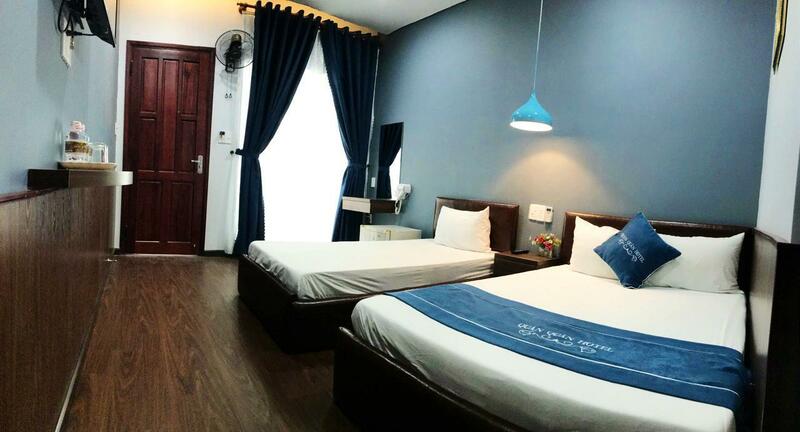 The room I had was very large, clean, and good, clean bedding with duvets (the weather was quite chilly when I was in Da Nang so the duvet was very welcome). The room also had a kettle, so I bought some tea from a nearby shop. The staff were very friendly and check-in and out were very smooth / easy. I can recommend this hotel to anyone who is on a budget and / or anyone who needs to get an early flight. I will stay there again for sure. Room was clean and the staffs were really friendly. You can hire a motorbike from the hotel or ask them for help(in case they are running out of vehicles). Hairdryer is available. However I couldn't use TV cable, and fridge couldn't be plugged in as the power cable was too short. Overall it was a good place to stay, would recommend for my friends. Close to the airport, however, a bit noisy from the streets. Room was average, bathroom okay. OK place to 'get your head down' in advance of an early morning flight the next day. Room was spacious and clean. Nice shower. Good wifi. Water boiler in room. 10 min walk to domestic terminal. No complaints. The location was good but it was near the street so u don’t need any alarm the traffic noice will wake u up. The internet was really slow and the blankets were not clean at all. Blankets were stained, did not appeared to be washed. Gecko and small bugs in room. Locate near airport canwalk about 10-15 mins. Great one night stay before back home. Good for those who want to catch an early flight out pf Da Nang. Toilet bowl leaking. Very old room and furnitures. A plus point, every staffs at the hotel are very polite and helpful. No attraction surrounding the hotel except located beside or near hospitals. Cafes and eating places are available. Google search for more. I will return if in transit to catch the next early flight. We stayed 2 nights in Danang. Although the room is quite old but all amenities are adequate. The hotel is very close to the airport and not too far from the city center. Staff friendly and guide us enthusiastically. Conveniently located if you want to walk to the airport. But that means you can hear the noise of planes at night. We only stayed for one night and this didn't bother us very much. Room was clean and comfortable but the bathroom door couldn't be closed. We had to use a table against it to keep it closed.